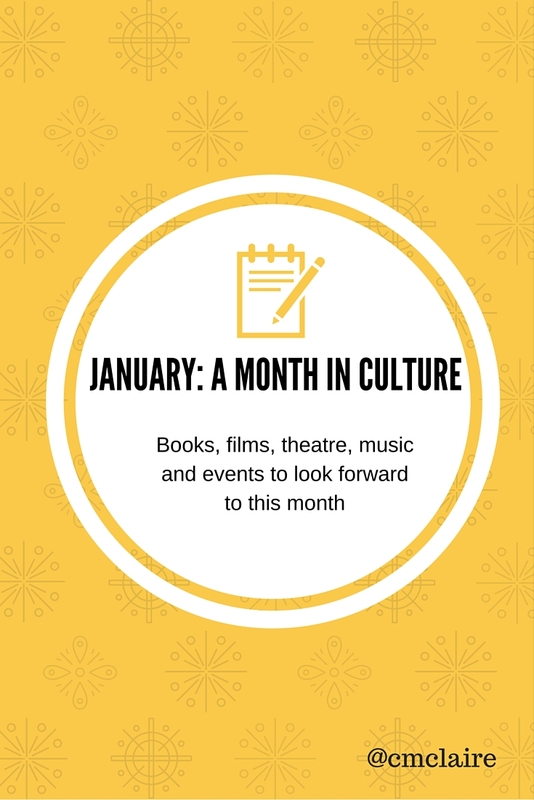 As I mentioned in my What To Blog About in January post last week, there are so many cultural elements to look forward to in a given month, and as someone who loves books, movies, theatre and film, I thought it would make sense for me to write about these things more often here on the blog. So once a month I’m going to write a little post about the cultural happenings I’m most looking forward to! With the awards and nominations season hotting up, there are SO many great films to see at the cinema. The Danish Girl and Joy both opened last Friday – I’ve yet to see the former but it looks like another triumph for Eddie Redmayne, and the latter is delightful. Joy was uplifting, clever and charming, and was probably my favourite of the three JLaw-Bradley Cooper- David O Russell films. This Friday sees the release of Tarantino’s latest, The Hateful Eight. It’s getting great buzz, but I’ll be waiting for the DVD – I cannot stomach Taratino levels of gore on a big screen! On the fifteenth, two frontrunners for Oscar glory are released here in the UK – The Revenant and Room. The Revenant looks creepy and stirring, and Leonardo DiCaprio looks barely recognisable as a haggard backwoodsman…might he finally get his Oscar? Room I’m very excited for; I adored the book and have heard amazing things about the two central performances (Brie Larson and Jacob Tremblay). On the 22nd Our Brand Is Crisis – as both a politics geek and a Sandra Bullock fangirl I’m on board – and The Big Short (stupendously stellar cast) both have their release. At the end of the month it kind of feels like Hollywood is throwing everything they can at the cinema and seeing what sticks! 13 Hours: The Secret Soldiers of Benghazi; The 33 (the trailer for this one made me weep so I’m sure to be a wreck for the movie! ); Spotlight and Youth all release on the 29th. There are plenty of new releases to get excited about this month. For the SciFi fans among us, the official novelisation of Star Wars: The Force Awakens, which was released last Friday, will probably be on shopping lists. It’s the time of year for new habits and goal setting, so books such as Start Where You Are (released today) and A Mindfulness Guide for the Frazzled (released on the 7th) are likely to be good, inspiring reads. Speaking of inspiration, two of the trendsetters of recent years release new books this month – on the 7th Marie Kondo releases Spark Joy: An Illustrated Guide to the Japanese Art of Tidying; and on the 21st Deliciously Ella Every Day will be published. It’s a quieter month for fiction after the weeks of big runs pre-Christmas, but I’ve a pre-pub copy of The Good Liar by Nicholas Searle which releases on the 14th January on my ‘to read’ list – sounds like a very interesting premise! I’m excited to go and see Guys and Dolls, which moves from previews to full run on the 6th at the Savoy (love that theatre!). I’ll be hoping to get to the Barbican for Richard II if any last minute tickets are released and to the Old Vic for The Master Builder (one of my favourite Ibsen plays) with Ralph Fiennes. At the Royal Court both Escaped Alone and Yen look like interesting productions. I’m also hoping to catch Beautiful and The Play That Goes Wrong as I haven’t managed to do so yet! There are always musical treats afoot in London. Two albums I’m looking forward to are Aoife O’Donavan’s In The Magic Hour (22nd) and Sia’s new album This Is Acting (29th). Gig wise I’m hoping to catch Angeleena Presley (one third of the awesome Pistol Annies group) when she plays Bush Hall on the 25th January. I may also go to see Cirque de Soleil’s show Amaluna, which takes over the Royal Albert Hall from the 16th. Awards season is well and truly upon us! I’ll be watching out for the gossip (and the gowns!) from the Golden Globes (January 10th), the Oscar nominations (14th) and the SAG Awards (30th). It’s such a great time of year to be a film geek! So that’s much of what I’m looking forward to. How about you? Haha! I used to be so good at planning ahead for stuff like this, so I thought sharing might be handy. Movies don't float my boat, but I have rather a lot of books I am itching to dive into. And a few gallery exhibitions.Have fun in your v busy month. Thank you! I love doing tonnes of reading during these grey months of the year. I'm so very excited that it is awards season, though it looks like this year I won't have seen as many of the films as in past years. Thanks so much! We are off to see it tomorrow. The reviews are awesome – it's firmly on the to do list!